Join coaches Beto dos Santos and Ze Luiz Sobrinho on our annual pilgrimage to the soccer Mecca of the world. 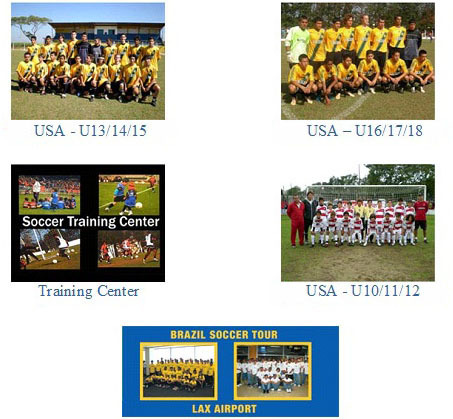 We are pleased to announce the opening of enrollment for the Summer 2019 Brazil Professional Soccer School Tour. Our 10th annual tour promises to be the best ever, with training, clinics, friendlies and tournaments scheduled with some of the top professional clubs in Brazil. This once-in-a-lifetime opportunity is designed to immerse the participant in both the spirit and culture of Brazilian soccer. For 14 days participants will train under the direction of Brazilian coaches from an elite professional academy and compete with some of the most talented soccer players in the world at their age level. Our past participants enjoy a real advantage with college recruiters with this prestigious course on their resume. The tour leaves Los Angeles California travel_date_leaving. Individual players or whole teams can be accommodated for boys between the ages of 10 and 18. Parents and coaches are welcome to travel with the boys. The tour is centered in the heart of Brazilian soccer in the states of São Paulo and the all-inclusive itinerary is designed to provide non-stop learning experiences and new relationships that will be cherished for a lifetime. For more information, contact our directors and coaches for the program. Beto dos Santos is a Brazilian native who signed his first professional contract with Club America (Mexico) at the age of 16. He played in the Major and Continental Indoor Soccer leagues, winning multiple championships, and all-star honors. Beto is currently Coach of FC Los Angeles Soccer Club. Ze Luiz Sobrinho also grew up in Brazil and played professionally as a goalkeeper for 15 years. He played two years in Europe (Portugal). He has a Masters degree in Physical Education and coaching experience at the professional level in the Brazil first division. Sobrinho is currently the coach for Pacific Coast Soccer Club and Autobahn Soccer Club. Julio Castillo is a native of Guatemala. He earned his Bachelor of Science degree from Cal State Northridge. He currently holds a U.S Soccer Federation “C” Coaching license. He possesses many years of coaching experience at the competitive levels in academy, college, high school, and club soccer. Castillo currently coaches at FC Los Angeles. At the high-school level he was the head coach of Reseda High School Boys Varsity. He has also led the Los Angeles Mission College Men’s soccer team to their first playoff appearance in years. We are very excited to welcome Julio Castillo to the Brazil Professional School. Andrew Carman grew up in Australia where he was one of the top junior players in the country. Came to the United States on a soccer scholarship in 1985. Standout Junior, Collegiate, and Professional careers. Division I United States Collegiate Soccer player.All-League & All-American Honorable Mention. Professional player in Europe (Holland). Professional player in United States. Coaching License from the California Youth Soccer Association – South. Over 15 years of soccer coaching experience. 5 years experience in Coerver Coaching Camps, USA. (Dutch training method).